Have you ever found some butterflies, been captivated by their magic, and wondered how long they live? Well if you have, you’re not alone. Not only did we get several questions about this in our email but I get it all the time when I’m giving tours at Maqui. We received this question through our bloggy partner Entohub. People seem to be relatively attached to the adult butterfly stage and are disheartened to learn that most butterflies only live about two weeks in the wild. They basically just get wings to find mates easier and lay eggs. This gorgeous metalmark will probably only flit around for a few weeks. However there are a few butterflies the dodge death’s clutches for a little while longer. So lets take a look at those. Some butterflies live longer because they’re eating something more substantial than the typical sugar water (nectar) diet. Here in Ecuador there are two major fruit eaters that come to mind. The Morpho Butterflies (Morpho spp.) and the Owl Butterflies (Caligo spp.) These butterflies don’t necessarily pierce the fruit with their tongues like true fruit eaters, but they do drink the seeping fluids from rotting fruit that falls in the forest. These butterflies can live up to three months. These by no means are the only ones that feed on fruit but they are some of the flashiest, well known examples. In a study comprising of one hundred butterflies the researchers found that the fruit eater, the Small Marbled Bush Brown lived a little longer than two months and the Widespread Forester lived a whopping nine months! 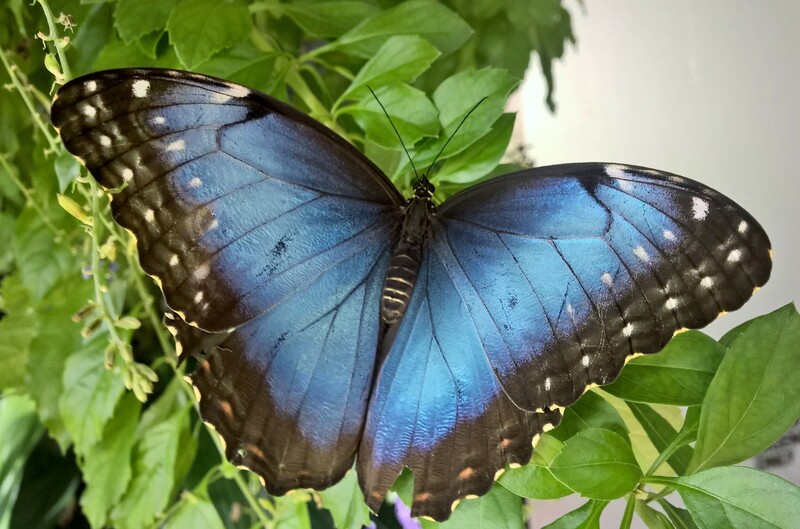 Morpho butterflies are “Non Flower Feeding” butterflies and lap up the running juices from rotting fruit. Heliconius butterflies eat pollen and have an average life span of about 6 months. We believe that the diet increases the adult life spans because of the increased uptake of proteins and amino acids. These nutrients which may be lacking or significantly reduced in the traditional nectar based diet, may be giving these super eaters a leg up. There is an advantage to living longer. The longer you live, the more times you can mate and the more eggs you can lay. Heliconius butterflies feed on pollen which is rich in protein and amino acids. There are a couple examples that show that while diet can be important in affecting life span, apparently it’s not everything. Australia has it’s own giant called the Queen Alexandra’s Birdwing Butterfly with a boastful wingspan of almost 10 inches! (25cm) After munching on the poisonous pipevine plant for its larval lifespan, it emerges and supposedly feeds on nectar. There is growing evidence that quality of larval food and they type of nectar the butterflies choose is important for increased lifespans. his giant can live up to three months so it falls right in there with our fruit feeders. This is one of the few insects that’s on the endangered species list. International trade is illegal. Monarch butterflies have two types of adults. The adults that are flying around in the summer (or in captivity if you’re a lab) live only for 2-6 weeks. However, Monarch butterflies have the adult that migrates from the northern United States/Canada back to Mexico in the fall. They undergo reproductive diapause – where they put on hold the whole egg laying thing until they reach the southern United States. There they lay their eggs on the newly emerged milkweed. These migrating adults that have to battle predators, changing weather systems, obstacles, cars, and whatever else gets in their way live between six and eight months. While they do feed solely on nectar, they’re general feeders and will lap up whatever happens to be around. Also the migrating butterflies have a unique biology to store extra fat and survive the cold. Most butterflies lifespans are short. Consisting of only a few weeks. However, there are a few exceptions. Diet seems to play a big role as fruit feeders and pollen feeders general boast the longest lifespans ranging from three to nine months. However there are a couple nectar feeders like the Queen Alexandria’s Birdwing Butterfly that happily saunters about for three months. But nothing is quite like the migrational biology of the Monarch Butterfly. The fall generation migrates over 4,000km (2,500 miles) from Canada to Mexico and the adults live between six and eight months. When they finally reach the southern US or Mexico, they lay their eggs. Boggs CL. 1986 Reproductive strategies of female butterflies: variation in and constraints on fecundity. Ecological Entomology 11: 7–15. Boggs CL. 1987. Ecology of nectar and pollen feeding in Lepidoptera. In: Slansky FJR, Rodriguez JG, editors. Nutritional Ecology of Insects, Mites, Spiders and Related Invertebrates (ed. John Wiley and Sons; New York, NY, USA. pp. 369–391. Brakefield PM, Kesbeke F. 1995. 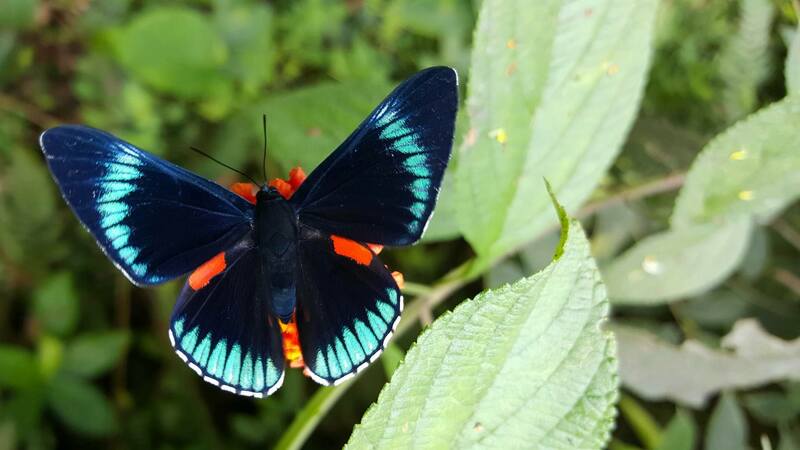 Raised adult lifespan and female fecundity in tropical fruit-feedingBicyclus butterflies. Proceedings of the Section Experimental and Applied Entomology of the Netherlands Entomological Society (NEV) 1995;6:93–98. Dunlap-Pianka HL, Boggs CL, Gilbert LE. 1977. 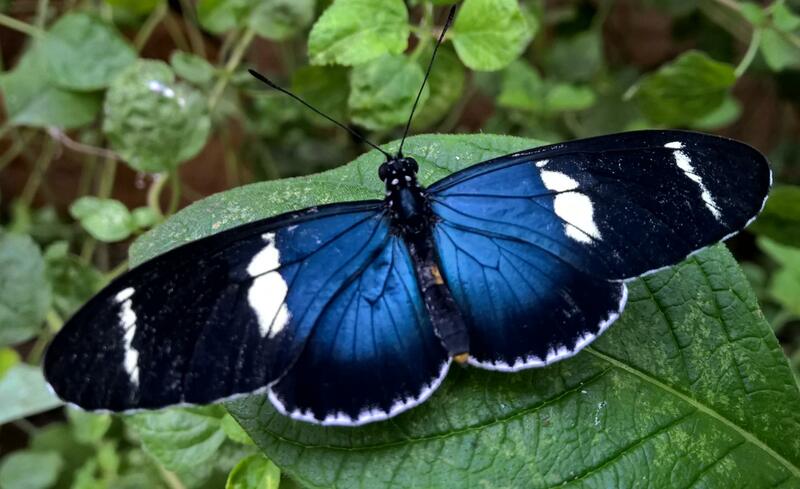 Ovarian dynamics in Heliconiine butterflies: programmed senescence versus eternal youth. Science 197:487–490. Herman WS. 1981. 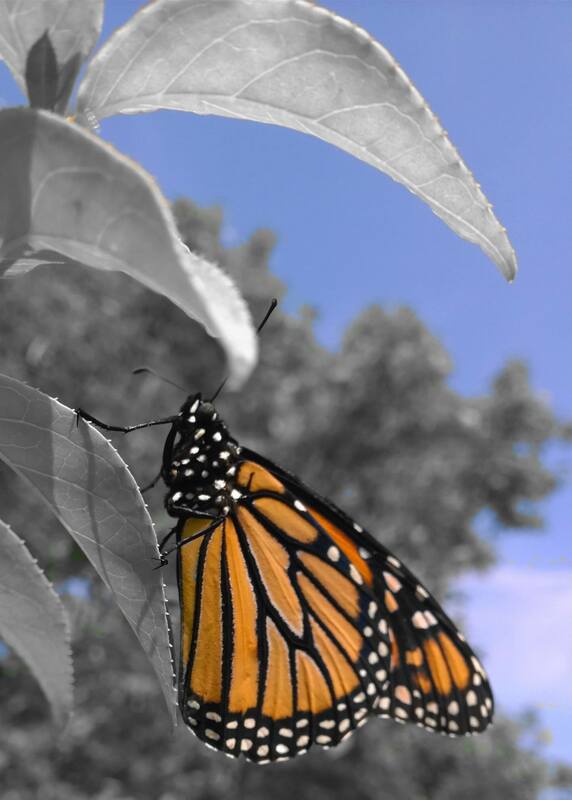 Studies on the adult reproductive diapause of the monarch butterfly Danaus plexippus. The Biological Bulletin 160: 89-106. Mevi-Schutz J, Erhardt A. 2005. Amino acids in nectar enhance butterfly fecundity: a long-awaited link. American Naturalist 165: 411–419. Molleman F, Zwaan BJ, Brakefield PM, Carey JR. 2007. Extraordinary long life spans in fruit-feeding butterflies can provide window on evolution of life span and aging. Experimental Biology 42(6): 427-482. Zhan S, Merlin C, Boore JL, Reppert SM. 2011. The monarch butterfly genome yields insights into long-distance migration. Cell 147(5): 1171-1185. This entry was posted in Ecology and tagged Butterflies, Butterfly, Lepidoptera, life cycle, life span. Bookmark the permalink. 2 Responses to Fleeting Moments: How Long Do Butterflies Live? Have there been genetic studies of non-migratory Monarch populations that show any differences with the “unique biology for storing fat”, and the “reproductive diapause” aspect? The white one in Hawaii, for example, and other populations in Florida, where those traits would seem to be unnecessary. Also, life-span comparisons with the migratory ones. Yes! It’s referenced in this article: The Monarch Butterfly Genome Yields Insights into Long-Distance Migration.